Sponge Rubber vs. Solid Rubber: What's the Difference? Home » Blog » Solid Rubber vs. Sponge Rubber: What’s the Difference? What’s the difference between solid rubber and sponge rubber? Both are elastomers, natural or synthetic polymers with elastic properties. Both are also subjected to vulcanization, a process that uses heat and a chemical agent such as sulfur to improve durability. Solid rubber and sponge rubber are available in many of the same compounds, such as EPDM, silicone, and neoprene. They can be extruded into the same shapes or molded into sheets, too. At the most basic level, the difference between solid rubber and sponge rubber is about air. Sponge rubber contains balloon-like cells or interconnected pockets that either hold air or permit its passage. Solid rubber doesn’t share this cellular structure. Both types of materials provide sealing and insulation, but sponge rubber provides better cushioning. Solid rubber provides stronger impact resistance. Each type of elastomer has its advantages then, but what else do engineers need to know? Solid rubber can be soft, medium, or hard. Durometer, a measure of hardness, is expressed as a number on the Shore A scale. The soft rubber that’s used in pencil erasers has a durometer of 40 (Shore A). The hard rubber in hockey pucks has a durometer of 90 (Shore A). This range of durometers is important to note because the difference between solid rubber and sponge rubber isn’t just about one being harder than the other. In addition to durometer, the physical properties of solid rubber include density, rigidity, and force distribution. Harder, denser rubbers provide greater resistance to abrasion, wear, and other stresses. 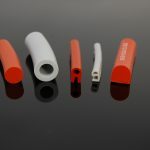 These elastomers can also resist permanent indentation. Harder elastomers are stiffer and less elastic, but they can repel applied forces and sudden impacts. Rubber has desirable acoustical properties, too. Harder rubber can redirect sound waves while softer elastomers absorb and disperse sounds. Solid rubber materials are used in shock absorbers, bumpers, and anti-vibration pads for vehicles, machinery, and equipment. These industrial rubber products reduce the risk of downtime by protecting mechanical parts. In the case of rubber bumpers, solid elastomers can absorb impacts such as when a truck strikes a loading dock. Applications for solid rubber seals and gaskets include surface protection and fluid containment. Like solid rubber, sponge rubber is available in different durometers. Sponge rubber is usually softer, but that’s not always the case. For example, a 40-durometer sponge rubber is harder than a 30-durometer solid rubber. 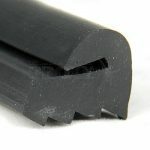 Differences in material hardness are important, but so is a rubber’s ability to return to its original thickness after a compressive force (such as a closed door) is removed. Sponge rubber provides better cushioning than solid rubber but can become over-compressed so that seal failure results. Sponge rubber is available with either open cells or closed cells. 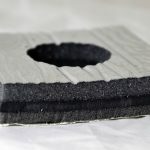 Open-cell sponge rubber contains open, interconnected pockets that permit the passage of air, water, gases, and chemicals when the material is not compressed. Closed-cell sponge rubber contains balloon-like cells that prevent the passage of these substances at low pressures. Foam rubber also has a cellular structure but is different than sponge rubber because of how it’s made. 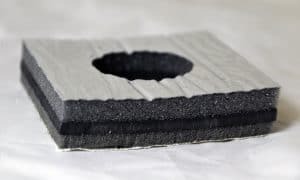 Sponge rubber products are used for cushioning, shock absorption, vibration dampening, weather stripping, and soundproofing. Sponge rubber is also used in thermal insulation, filters, and custom gaskets that need to meet various standards and approvals. For example, silicone sponge rubber with a UL 94 flame rating is used in electrical equipment. Solid rubber materials can also meet different standards and approvals, so engineers need to select compounds with care. Do you have questions about solid rubber and sponge rubber? Do you need help choosing the right compound, or are you trying to strike a balance between cushioning and impact resistance? 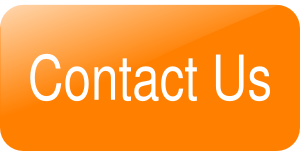 Elasto Proxy can answer your questions about elastomers and fabricate the custom seals, gaskets, and insulation that you need. To get started, contact us.